What Exactly Is a Black Swan, Anyway? Most investors equate a black swan with a market crash. But that’s really putting the cart before the horse. A black swan is simply an event that no one saw coming… that also has a large, outsized impact. So a market crash is more the result of a black swan than a black swan itself. And a black swan need not always be something bad. Sure, a meteor falling out of the sky and hitting your house would be a black swan event. But so would be an inheritance check for a million dollars from an aunt you never knew you had. Both would be completely unexpected… and both would have major impacts on your life. 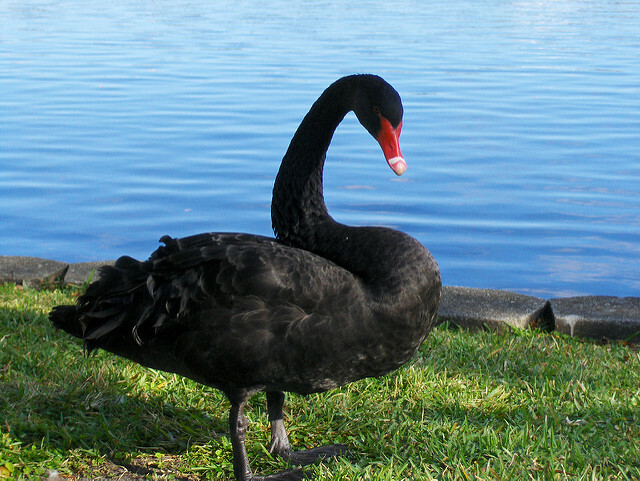 Trader, professor and financial writer Nassim Nicholas Taleb made “black swan” a household word (at least in households that regularly debate financial topics… like mine) and gave it its current meaning, but the expression has been around a lot longer for something that was assumed to be impossible. The first recorded use of black swan as this kind of metaphor dates to the Roman Empire, and it was a common expression in 1500s London. Despite it being unpredictable beforehand, we spin a narrative that makes it seem completely predictable in hindsight. And this is where you get back to the fun parallels with finance. No country has ever left the European Union before… and no opinion poll or betting market suggested it was possible. So the financial markets assumed a UK vote to leave to be impossible. Well… it turned out that it wasn’t impossible, and the impact was definitely outsized. No one knew at the time – or knows now – what the full impact of Brexit will be once all is said and done. And as for the narrative, after the fact it became “obvious” that Brexit would happen because of the dissatisfaction of older, blue-collar British voters, the rise of Donald Trump in America or any number of other reasons. So, Brexit does indeed make the cut as a black swan. Even if you can’t anticipate individual black swans, you can definitely take a few simple steps to “black swan proof” your portfolio… or at least come close. First, don’t make the assumption that something can’t happen simply because it hasn’t happened yet. Don’t be overconfident based on your limited observations. Second, always have a little portfolio insurance. That can mean different things to different investors, but as a general rule it means you should have a few assets in your portfolio that zig when the market zags. Taleb himself made enough money in a single day to walk away from Wall Street forever. He was “long volatility” on the day of the 1987 stock market crash, and walked with millions when the market cratered. Long-Term Capital Management went out of business, not because it made bad trades, but because it borrowed far too much money to make them. Had the professors simply borrowed less, they would have been able to ride out the storm and live to trade another day. Excessive leverage can turn a safe investment into a risky one and make you more susceptible to black swan risks. So simply avoiding debt will do wonders for making your portfolio black swan resistant. I’m not writing much this week, and there is a good reason for that: I’m on a Christmas ski trip, trying my best not to make a fool of myself on skis. Assuming I don’t get myself killed, we’ll pick this up next week. “She is in no hurry to ‘normalize’ rates. She’s raising them today because she’s afraid that if she doesn’t, she might have to act more aggressively at some point in the future. But she also made it very clear that she’s going to remain very accommodative for quite a while to come. Bottom line, we might be sitting at 25 basis points for a while. What does this mean? It means the dollar might give back some of its recent gains. All else equal, it’s also good for the markets broadly. The Fed isn’t taking away the punch bowl. It’s just putting a little less booze in it. All in all, this is probably the best outcome we could have hoped for,” said Charles Sizemore, principal of Sizemore Capital. See “Fed’s done, now traders look for Santa rally” for the full article. The cost of the collaborative robots has fallen to as low as $20,000 making them affordable for even the smallest of operations. Compare that with the wage of a machine shop operator of $22.42 per hour as reported by the Bureau of Labor Statistics. This operator, who gets sick days, holidays, time off every day after work and benefits will cost a company roughly $44,000 per year. The robot, which can operate 24 hours per day and never calls in sick, would save the company money over hiring the operator in just under six months. And that’s if they simply worked the same hours. Of course, not every new use of a robot turns out to be a great idea. Lowe’s Home Improvement (LOW) is rolling out two retail robots in a subsidiary store, Orchard Supply Hardware, in San Jose, CA. The units will greet customers at the door and ask if they need assistance. Customers can ask where products are located, place a bolt, nut or nail on a 3D scanner that will determine the exact size and where replacement pieces are located in the store. It’ll even provide video conferencing with personnel who can assist clients with their needs for projects. There is a big problem here. As Rodney pointed out later in the article, most people going to a hardware store don’t know how to articulate what they want, and they don’t have a replacement part to scan. And waiting for the robot to call a customer service rep via teleconference would probably cause me to smash in the robot’s iPad face with the first heavy-duty tool I could get my hands on. At the very least, I would leave the store and head to the Home Depot (HD) next door. Both of these developments — collaborative and guide robots — increase the speed at which people are being replaced in the workplace. Such displacements have happened throughout history, constantly killing different types of employment, driving would-be weavers, carriage makers, secretaries and now machine operators into other jobs. While there’s no doubt that society as a whole is better off with greater productivity, the picture isn’t so bright for the would-be machine operator. With median income falling as the middle class loses ground, we need a faster method for retraining displaced workers and training those new to the workforce in jobs that are unlikely to be automated in the near future. Otherwise, we’ll end up with many potential workers who can’t even get a job at McDonald’s… because that company is also automating the ordering process. We’re still a long way off from having guides replace customer service personnel. But self-checkout lines have already reduced the number of cashiers at Home Depot, Lowes, and even Walmart. Again, all of this is great for productivity…and keeping labor costs in check. But it does raise the uncomfortable question of where low-skilled workers will find jobs a decade from now. Related: Labor replacement is not only making low-skilled labor redundant. It’s also weeding out stockbrokers and financial advisors: Running a financial advisory practice in the age of the robo-advisor.